CD 12track(75min) in DVD case with 4 Photo Inlays and is handnumb. an limited of 150 copies! 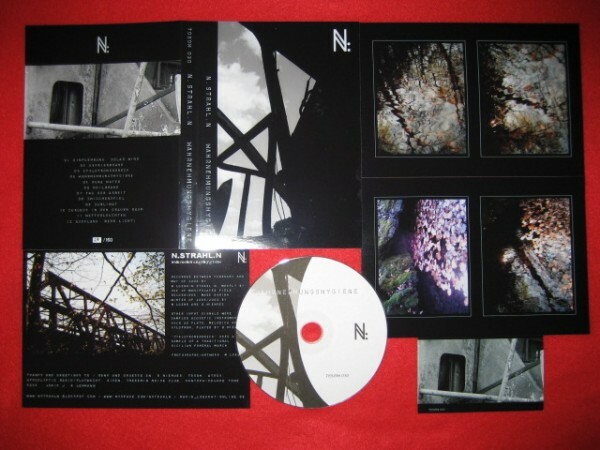 Info: Wahrnehmungshygiene is the third TOSOM release by N.STRAH.N, a fantastic and very busy project from Germany. In the past N.Strahl.N released also some works on different labels (like Apocalyptic Radio or Krakilsk) and some very limited self-releases. All the stuff by N.Strahl.N is very worth to check. "Wahrnehmungshygiene" was recorded between February and May 2006, mostly using field recordings. And this time the project also used, for some compositions, acoustic instruments . The music is more than normal and usual soundscapes, this are sounds for a head cinema. Customer evaluation for "N.Strahl.N - Wahrnehmungshygiene (Lim150)"